Since Google launched Android in 2008, there have been issues with fragmentation – although Google Play Services has helped this issue somewhat, the competition does tend to drag version numbers out at any opportunity. OEMs have continually lagged behind when delivering updates to phones. True, Google’s Android now resides on over 1 Billion devices as the most dominant mobileOS around, but many of them languish on outdated versions, with no hope in sight for an update, at least to the software version #. But that’s 1 Billion devices, there are 7 Billion people out there in the world and Google wants to bring Android devices to all of them. Cheap, yet up-to-date Android devices, which reflect their vision of what Android is. Not Android as seen by Samsung or HTC or any of the other Open Handset Alliance members, who are responsible for the ‘Fragmentation’ problem, but as Google sees it. Enter Android One. Android One is a platform launched by Google at their developer conference Google I/O this year. Android One involves Google developing a reference platform with a standardised hardware spec, that hardware manufacturers use to release devices. Manufacturers can still customise the software with apps from Google Play, but it’s a pure Google Android experience and the handsets are guaranteed to receive Android updates directly from Google almost as soon as they’re released – for two years. Imagine, 5-6 Billion Android devices updated to the latest version of Android by OTA update as soon as a new version of Android is available. What Fragmentation problem? It would certainly put pressure on OEMs to develop updates for their skinned Android software faster, scale their skin back, or just adopt the Android One platform for their own devices. Android One has entered the market at the low-end to begin with, but there’s plans to step it up next year with a mid-range Android One. The first wave of Android One handsets hit India last month, releasing handsets from Micromax, Karbonn and Spice. They’re identical in terms of hardware, but contain slightly different software loads as per the Android One creed. They’re all around the AU$110-AU$120 mark, and all only available from suppliers who ship in India only, nevertheless, we have a Micromax Canvas A1 Android One handset – it’s the one Google used in their slide at Google I/O, how could we not get that one? So, It’s a lofty goal from Google, but does the product match up to what they have in mind? Let’s find out. The Android One reference spec is consistent across all the manufacturers who are making the devices. The specs start with a 4.5” 480 x 854 resolution display and it takes up a lot of the front of the display, but not all of it, that’s due to some pretty decent bezel around the sides, and especially the top of the phone. It’s nothing terrible, just something that is possibly due to the lower cost nature of the phone. It’s the smaller screen which inherently makes the Canvas A1 a slightly smaller device overall. It’s quite pleasant to go back to using something with a smaller screen and not have to worry about putting a 5.5” (or bigger) device in your pocket to carry around. The size overall is quite comfortable to hold, perhaps one day phone sizes will shrink again and we’ll settle on 4.5” as a screen size that just feels right. Mediatek has had issues with the open source community previously, mainly over availability of source-code for their processors. Mediatek have generally made source available but charged for the privilege, treading a fine line over the provisions in the GPL to charge for associated costs of providing the source. With Google using the Mediatek MT6582 processor, there has so far been a change of form and the Android One source code is now available. Android One is designed for the developing world. For many people in these countries, a smartphone is going to be their first – and indeed, with the functionality you can get out of a modern smartphone – their only computer. Google has made some concessions to this with the design of Android One, taking into account the infrastructure in place in many of these countries, including the fact that access to constant data connections is most likely not going to be possible. The first sign of this is the storage situation. The Android One platform comes with a fairly small 4GB of internal storage of which you can install 2.5GB of your own apps, to expand this you can install a microSD card in the phone to store music or movies on. You still can’t run apps from the SD Card, but it’s a concession which many weren’t expecting from Google, since they stopped including expandable storage in their own Nexus phones after the Nexus One. Further concessions to a platform aimed at the developing world have also been made on the phone. With no access to consistent data connections in developing countries, obviously streaming music is out. So, Google included an FM Radio in their specification, people can groove to their tunes wherever there’s an FM signal. Google has kept other parts of their reference design fairly low-end to keep the price down. The phone only has a fairly low-end 5MP camera sensor on the rear paired with an LED flash, it also has a 2MP front-facing camera. Compared with what’s out there though, it’s actually a pretty decent camera setup. Wireless wise, it’s all 3G or Wi-fi (up to Wireless N). LTE is still something fairly hard to get in most developing nations, so including LTE would be an added extra that would add to cost without enhancing the user experience, so it’s absent. There’s still Bluetooth 4.0 though, so if anyone wants to connect one of those fancy new Android Wear watches, they can. The phone comes with a fairly compact 1,700mAh battery, which is fairly small by today’s ‘Super Phone’ standards, but for the Android One platform it seems right. It’s large enough to let people do smartphone ‘stuff’ but it’s not like people in developing markets, many of whom are using a smartphone as their only ‘computer’ are going to be social media junkies, using their phones constantly, so the size seems to fit. The Micromax Canvas A1 is a fairly decently built smartphone. The A1 has a removeable, battery, so has a plastic rear battery door which covers the entire back of the phone. The rear door is made out of a fairly cheap plastic, though has a soft-touch feel to it which feels similar to the plastic encasing the first commercially available Android phone, the HTC Dream, it feels fairly nice, but still shows up fingerprints fairly heavily. The rear of the phone has a fairly large camera bump reminiscent of the Nexus 5, this bump also includes the LED flash. This of course means that the plastic rear has a large hole cut out for the camera. 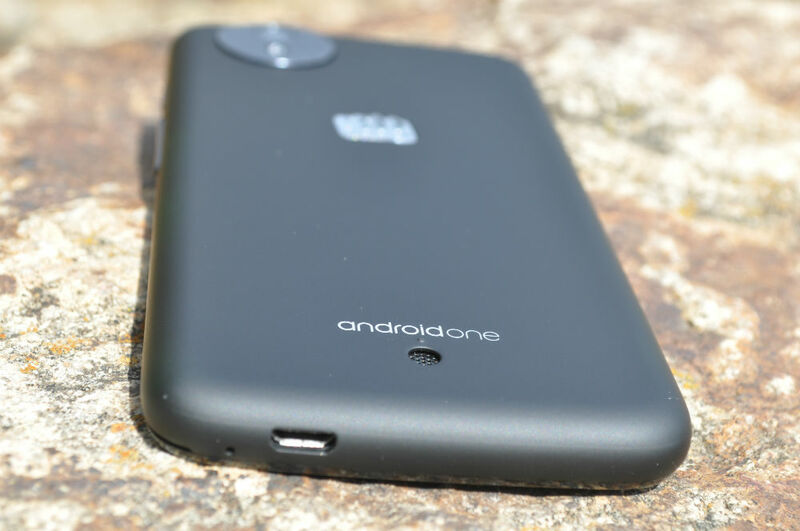 The Android One logo is placed at the bottom of the phone, with a small external speaker grill beneath it. Towards the top is a textured chrome Micromax logo, which for all appearances seems to be in the shape of a fist punching. The front of the phone is entirely covered in glass, though not Gorilla Glass – that would add an extra layer of cost, but it’s most likely some sort of toughened glass. The glass does tend to attract fingerprints though, but wipe it off and it’s good to go. The front of the phone has a single speaker hole at the top with the front-facing camera to the left and a single colour notification light to the right. There’s a bit of bezel either side but nothing unexpected. Micromax has included the volume rocker as well as power button on the right hand side of the phone, leaving the left clear. The bottom of the phone is where you will, as usual find the microUSB slot but like a number of HTC devices, it’s off-centre, sitting to the right hand side, but thankfully is mounted the right way up. The top of the phone is where you’ll find the 3.5mm headphone jack (you do need headphones to use the FM Radio, they’re used as an antenna). Overall, the Micromax Canvas A1 is fairly well built, it’s not got much, if any flex in the chassis. The plastic gives it a fairly cheap feel and it’s fairly thick, so holding it you’re under no real illusion that it’s a cheaper handset, but for what it is, it’s fairly nice. Smartphones are by necessity mostly screen. Google has mandated a 4.5” screen with a resolution of 854×480, giving a pixel density of almost 218ppi. It’s no ‘Retina’ display but it’s a decent screen, though a little bit blocky when reading text thanks to the lower resolution. The screen has fairly good viewing angles thanks to the IPS display that Micromax have used. It’s also not going to win any awards for colour depth as it’s fairly washed out, but it’s Ok. The screen brightness is a slight issue, especially when outside. With the auto-brightness in effect, the phone struggles to find the right balance of brightness but take manual control and amp up the screen brightness and you’re good to go. The screen is pretty much what you’d expect for a lower end phone, if you’re fresh off a couple of QHD screens, the difference is staggering, but if you’re entering the smartphone market with an Android One handset as the majority of customers for the Micromax Canvas A1 will be, it’s not bad. Battery Life on the Canvas A1 was surprisingly decent for a 1,700mAh battery. Users of the phone won’t generally be syncing 4 Gmail accounts, while updating various social media platforms, surfing the web and watching YouTube videos, or indeed spending the day playing games – but I did and it held up pretty well for such a small battery. But, it was fairly dead by 3pm after taking it off charge at 6am and if you don’t have a charger on-hand you’ll be out of luck. That camera bump is the standout feature of the Micromax Canvas A1, it’s a distinctive design flourish which as I said earlier seems to mimic the Nexus 5. It’s actually something I liked and was a contributing factor in deciding to get the Micromax Android One handset over the Spice or Karbonn models. The Android One handsets have a 5MP camera sensor on the rear capable of taking a 2592 х 1944 resolution photo. There are a number of options for the rear camera, from the full 5MP in 5:3 aspect ratio, though 4.9 in 4:3, or if you’re after in 16:9 aspect ratio you’ll have to drop down to 3.7MP. The front-facing camera at 2.4MP will take a 16:9 AR photo, or a 1.9MP photo at 4:3 Aspect Ratio. There’s various options in quality and aspect ratio for both the front-facing and rear cameras based on what you want. It should suit most people, but generally most people will just want to point and shoot and won’t go into that much detail. No matter which resolution or aspect ratio you choose though, it’s not a great photo. In fact in less than great lighting it’s generally a grainy affair. But, like all cameras, give the sensor a well lit subject and the camera will surprise you. As usual you get video, with the 5MP sensor on the Canvas A1 capable of recording up to 1080P resolution video on the rear camera, while the 2MP Front-facing camera can recording up to 720P video. Being stock Android, the camera software is the Google Camera software from Nexus devices. It’s not great, but for a happy snapper, the camera allows you to do all the usual things you get : HDR, PhotoSpheres, Panormas (including Fisheye) Lens Blur shots and just stock standard photos. The Micromax Canvas A1 (and indeed all the Android One handsets) covers only two 3G bands, offering HSDPA 900 and HSDPA 2100. In deference to the markets they’re in though there’s more 2G bands covered, with 850, 900, 1800 and 1900MHz frequencies covered. Don’t expect HD voice on the handsets either, it’s just a good, honest connection and it maintains calls as well as a data connection fairly well. The Micromax Canvas A1 has Dual-SIM slots which is common in emerging markets, the phone works quite well with Telstra and Optus SIM cards inserted, I was able to swap between the SIM cards, for Data and calls quite easily. To swap, it’s a matter of going to Settings > SIM Cards and then selecting which SIM card you want for which purpose : Data, Calls and SMS. The phone configures itself with APNs and it all worked quite smoothly. The cellular connections display in the notification area at the top of the screen, showing signal strength for each – SIM1 on the Left and SIM2 on the right. You also get a reminder of which carriers SIM cards you’re using when you swipe the notification panel down. The Canvas A1 also has Wi-Fi 802.11 b/g/n, Bluetooth 4.0 (LE), GPS with A-GPS and an FM Radio. All of this works fairly well, the Wi-Fi connects to access points quickly, though it can’t see the 5G network on my, or any other routers I tried. The Bluetooth though has issues, seemingly starting to die when the screen turns off. I had the phone connected to the LG G Watch using Android Wear, as well as my Jabra Sports+ Bluetooth headset, when going for a run, the phone audio coming through would cut out as soon as the phone screen turned off, so I ended up killing the screen timeout and leaving it on. It’s a weird bug, but something I hope gets fixed. GPS was pretty decent, it locked onto satellites relatively fast, and you can play Ingress or get directions in Google Maps fairly easily. There is one thing missing from the Android One spec which seems to be inconsistent with Google’s previous Android hardware roadmap: NFC. It’s something that may show up on mid-range version of Android One or on future handsets once Google sorts out contactless payments on a global scale, but until then, no NFC for you. The Android One has an Ok earpiece, it’s fairly clear, it’s nothing special certainly but it’s good enough for you to make and receive calls on. If you’re talking about using the phone to play music on, or show someone a video on, it’s fairly disappointing. The almost miniscule speaker on the rear barely contains enough oomph to impress anyone. Volume wise it’s fairly weak and from a quality perspective it sounds like it’s coming through a cardboard tube. Bluetooth audio works Ok, the headphone jack delivers audio to wired speaker Ok, overall that’s the best way to describe the Micromax Canvas A1 audio: Ok, it’s nothing special, but it’s not unusable. With a 1.3GHz Quad-Core processor on board paired with 1GB of RAM, the Android One platform does fairly well. It’s mostly quite responsive, although you do run into lag occasionally. The lag mainly presents when interacting with the share intents menu or switching apps. Generally though when navigating around the interface it’s quite snappy, it’s a pleasant response, most likely due to the trimming down of KitKat(Android 4.4.4) to run on lower end systems, specifically with as low as 512MB RAM. Antutu and Geekbench results are displayed below for your pleasure. Android One phones all come with Android 4.4.4 straight out of the box. As a platform, Android One software is controlled by Google, who has guaranteed software updates for all phones for two years. In their announcement of the Android One platform, Google specifically stated ‘Android One devices will be some of the first to be updated to the Android L release later this year’, so this will definitely help sales, as well as laying to rest any worries of being left behind. The Android One phones are at their core a miniature Nexus device, with unlockable bootloaders (fastboot oem unlock anyone?) and guaranteed updates. The only thing missing from the experience is Factory Images for them to restore to stock – which if Google starts supplying would make for an amazing developer device for developers in emerging markets. There is literally no skin here beyond the stock Google Now Launcher. If you’ve tried the Google Now launcher, which is available on any Android phone running Android 4.1+ then you know what you’ll be getting into. Google has added a couple of different wallpapers and alert tones, but there’s nothing overtly different apart from those touches there are no differences. The Micromax Canvas A1 is sold exclusively through Amazon India. The fact that this app is present isn’t terribly surprising. It’s also tied into a bonus when you purchase the phone which gives you Amazon.in coupons worth Rs.2,000 to spend on Watches, Shoes & more. Hike Messenger is a home- grown messaging client from India. The client had, as of June over 20 Million users, and was still climbing. It’s a popular messaging tool but not as well known as the obvious big one – WhatsApp. M! Live is a Micromax app that seems to be installed on all their devices. From what I can tell it’s essentially their own app market place, though delivered over a mobile webpage rather than a standalone app. Reviews of the app from Micromax customers do not bode well for it, with many complaining of Anti-Virus software classifying it as ‘Malware’. AskMe is service catalogue which you can ask to locate goods or services in your town. The app also includes deals and classifieds and the ability to rate local businesses. It didn’t seem to do much for me but hey it’s there. Developer: Getit Infoservices Pvt. Ltd. Currently, the only place you can ‘officially’ get a Micromax Canvas A1 Android One phone is from Amazon India who have an exclusive on the phone. Of course you can turn to eBay, but expect to pay a premium of up to $200 including delivery. None of the importers like Yatango or Kogan are importing them yet, but maybe one day they will. Google started down the path of low-end hardware for developing markets with handsets from Motorola such as the Moto G, and then later by the Moto E, but somewhere down that path they must have decided delivering a reference platform to hardware makers would be a far more effective option. This not only allows them to divest themselves of Motorola who so far had failed to turn a profit, but also allowed them to appear free of influence of a member of the Open Handset Alliance. With Android One, Google set themselves a high bar to aim for. Their original goal to provide smartphones for under $100 missed by a small mark, but if the Micromax Canvas A1 is anything to judge by they have delivered a platform which is well worth the extra few dollars. Though there are some small concessions to hardware versus price on the Android One handsets the Canvas A1 is a shining example of what can be done with low-end hardware free of cruft which clogs up the user experience and hardware resources. If you are in need of a decent Android Handset and want to keep abreast of updates, you’d be hard pressed to go wrong with the Micromax Canvas A1. The downfall is availability as all three handsets are locked into exclusivity deals – Micromax with Amazon.in, Spice with Flipkart and Karbonn with Snapdeal – with retailers who only deliver to addresses in India. Still, we expect to see more handsets in more countries by the end of the year, perhaps it will get easier very soon. With availability of the handset limited as it is, we were lucky enough to be helped out by Ausdroid reader Ryan in getting a handset. He went above and beyond and we TRULY appreciate the effort he went to in getting the handset to us. From Ausdroid, a truly heartfelt thanks goes out to you. I should get my A1 Canvas tomorrow (advantages of working with lots of Indian outsourcers). My plan for it is to be my spare / backup phone with my Vfone No Plans SIM in it. It will replace my ailing SE candy bar phone. Used when overseas (only important people know the number) and lent to non mobile owning (insert old) relatives when need arises. Thanks for that write-up, Dan. If there was a 32GB version of the Canvas available, Moto would have to fear for the viability of the E and 3g G.
With improvements to the SD Card API in Android Lollipop – you could do a lot with the microSD card. Dan, do you have the Ausdroid URL handy for where those improvements have been discussed? Those cons are not really valid….. Ur article clearly states it a mid range costs around $110-$120 …what would you expect from it…..
What you pay is what we get, i would agree u can state a phone which will do better that’s it the same price range. If you would like to review the phone yourself and come up with cons feel free. Those are the downsides to the phone, they aren’t stated with price range in mind they are just cons of the phone. I had to come up with cons and for that phone, that’s the cons. Either way I would tell ANYONE to purchase one of these in a minute over ANY handset in this price bracket. It’s a really great handset.